At Menzie, we want your project to come out exactly the way you envision it! One of the tools we offer for design assistance is our Slabsmith technology. This state-of-the-art program allows us to combine your space's specific measurements and the stone you've hand-selected from our warehouse to show you exactly what your finished project will look like in your home - before it's installed! This process goes far beyond just adding a drawing to a photo of your house; it creates a digital replica of the exact slab you've chosen. Slabsmith's technology replicates every inch of the slab into a digital model, including dimensions, edges, color and any flecks or veining exactly as they appear on the physical piece of stone. Using proprietary calibration technology, Slabsmith produces a digital slab that is accurate to a millimeter or less and whose color is accurate down to the most subtle of variations. 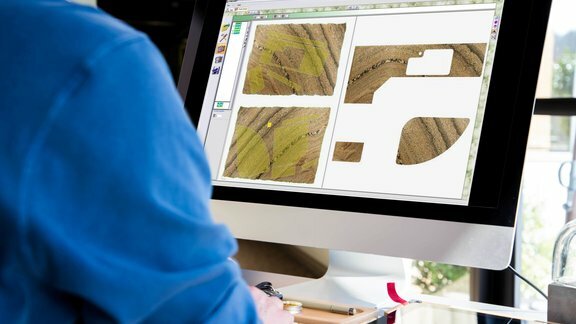 Once a digital slab is created and saved with a complete record of identifiers such as material name, lot number, thickness and color, we have the ability to search for it in any number of ways - even a specific size and shape. So if you're looking for a particular L-shape to fit your cabinets, we've got you covered! You choose your slab, we'll lay it out for you, then we'll send you a proof of the design for your approval. That way, if you want to change the direction of the veining on your counter or update anything else, we can do so digitally before cutting anything! Then, with your approval of the layout, Slabsmith exports the design and dimensions for our cutting tools, and we can move on to the installation of your new counters. Another benefit to using Slabsmith comes later on, during the maintenance of installed projects. If you need to replace part of your counter, Slabsmith's database contains a complete history of every layout we've installed. This allows us to open your layout and select a few options from our current slab inventory, then arrange them with your current design until you're happy with the new appearance. All we have to do then is cut the piece and install it! Slabsmith improves the slab-shopping process from start to finish, and we're big fans of how it can ensure satisfaction and accuracy for our customers. Stop in today to find out how Slabsmith can help with your next project!